…for price shocks in your backtests, the truth about diversification, advice for algorithmic traders, and much more. Be sure to check out some of his bestselling books A Guide to Creating a Successful Algorithmic Trading Strategy, and Trading Systems and Methods, 5th Edition. You can also find more information on Perry at his popular Algorithmic Investment Strategies website: http://kaufmansignals.com/. Kurt: Take us back to the beginning and what your first experience in trading was like. CloudQuant Thoughts: The points that Mr. Kaufman makes on the instant availability of “noise” is very interesting. We don’t consider this to be noise at CloudQuant. We consider it to be an opportunity for data scientists and crowd researchers. These result in new data sets to research and to seek trading signals. What one person considers to be noise another person may find to be an interesting signal source! …POMS time series. Next, a Granger causality analysis is used to correlate Dow Jones Industrial Average (DJIA) daily close values with the GPOMS and OF mood data. In the third phase, an application of machine learning known as a Self-Organizing Fuzzy Neural Network is used to predict DJIA values based on past DJIA values and public mood data from OF and GPOMS. CloudQuant Thoughts: We have seen a number of people using Alternative Data Sets, including those generated from social media, to seek out alpha in their trading. …tive data, there is increasing demand for data scientists and machine-learning professionals who can work with petabytes of unstructured data sets. In January, Point72’s Aperio unit advertised for a “machine learning-data scientist” on AlternativeData.org, a public website that covers the industry. CloudQuant Thoughts: Haven’t we been saying that there is opportunity in Alt-Data for a very long time? …presence in the IoT space with new products and acquisitions. This space could drive substantial growth for SAP over the long run. Combined with its ongoing efforts to strengthen its offerings in the machine learning space, the company is expected to do well in the competitive software industry. Like our charts? Embed them in your own posts using the Trefis WordPress Plugin…. CloudQuant Thoughts: Machine Learning offerings are now an indicator of the financial strength of a company. We wonder how many investment bots are seeking out ML offerings to give advice on investments. …, AI is set to transform all facets of life ranging from heavy industry to medicine, transportation, commerce, art, communication and of course, finance. Already, we are witnessing its application in algorithmic trading, underwriting, personal finance, market analysis and data mining and portfolio management. In recent years, advances in AI and increases in processing power and the sizes of available data sets have placed these intelligent tools and algorithms in the hands of a wider class of investors. As a result, everyday investors are coming up with smarter, less risky, trading strategies. CloudQuant Thoughts: AI and machine learning are showing up everywhere in the investment and trading industry. We use it to generate trading strategies. Others use it to pick investments. It is a growing focus of innovation. …If you, like many others, are wondering how artificial intelligence (AI) will change your daily life, envision this: Inside your home, items will become self-aware of their own lifespan and will autonomously order better, cheaper replacements that arrive exactly before their depletion. From lights that reorder themselves to appliances that are smarter and understand your needs and lifestyle, AI will integrate seamlessly into your home. CloudQuant Thought: The best sentence in this article says “Context, intent and action are themes that help drive decisions.” This is so very true. In AI and ML for trading, you may need to look at the context of the entire market. When recently reviewing technical indicators that are available using TA-LIB in our backtest engine one sees that these alpha signals are best when overlayed with overall market context! 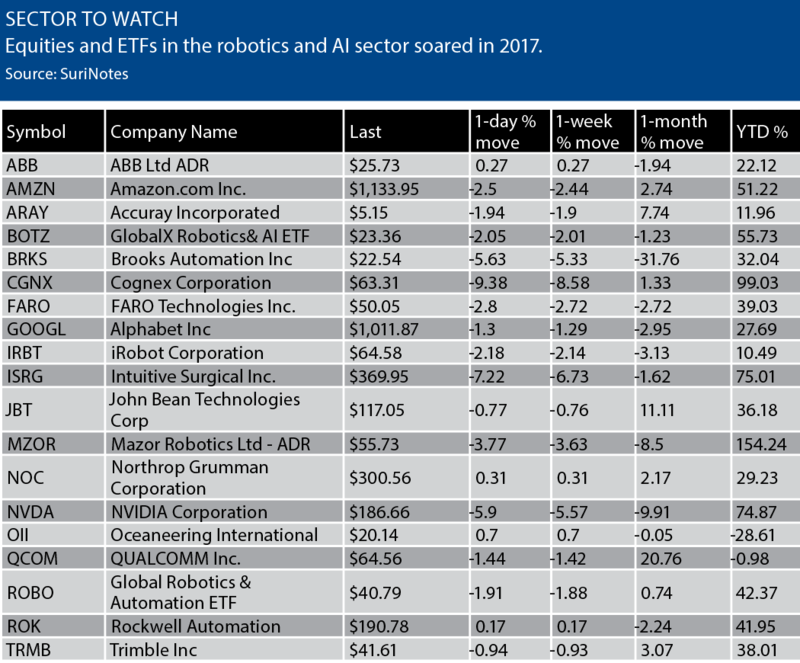 CloudQuant Thoughts: What a great list of AI and Robotic Stocks and ETFs. …This article originally appeared in the Motley Fool. The artificial intelligence (AI) market could grow at a compound annual growth rate (CAGR) of 57% between 2017 and 2025 to become a $36 billion market according to Grand View Research. However, this fragmented market can be tough to navigate for investors who haven’t kept up with the latest AI developments. Let’s highlight the main trends investors should keep an eye on. CloudQuant Thoughts: One good list deserves another. … With the new rules coming, Facebook also decided not to roll out some products in Europe that would violate the privacy laws. Last November, for instance, the company unveiled a program that uses artificial intelligence to monitor Facebook users for signs of self-harm. 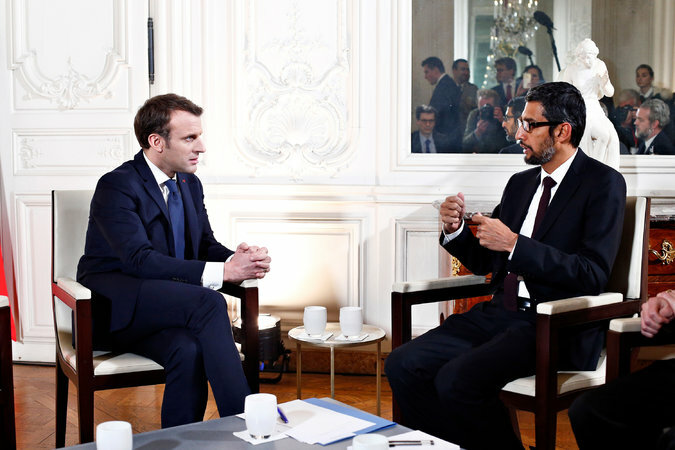 But it did not open the program to users in Europe, where the company would have had to ask people for permission to access sensitive health data, including about their mental state. The social network has also kept out of Europe facial recognition software that tracks when photos of users are posted across the platform. CloudQuant Thought: CloudQuant Thought: This is worthwhile watching to see how it all plays out. …2017 was a huge year for Kaggle. Aside from joining Google, it also marks the year that our community expanded from being primarily focused on machine learning competitions to a broader data science and machine learning platform. This year our public Datasets platform and Kaggle Kernels both grew ~3x, meaning we now also have a thriving data repository and code sharing environment. Each of those products are on track to pass competitions on most activity metrics in early 2018. CloudQuant Thoughts: The datasets available with 1-minute timestamp data for BitCoin and Crypto Currencies have our imaginations going wild. We like the 1-minute data but want more! Check out Glassdoor’s report for the rest of the top 50…. CloudQuant Thoughts: Every data scientist needs to hone skills somewhere. CloudQuant offers a great place to prove out those skills before your job interview. …. Most surveillance cameras are passive, however. They’re there as a deterrence, or to provide evidence if something goes wrong. Your car got stolen? Check the CCTV. CloudQuant Thoughts: Where will this take us in the future? Will we be able to use satellite data to predict crop yields? How about manufacturing activity at a plant? Will video feeds from shopping centers give us an idea about the retail sector? There is a lot of promise to this data from a trading perspective. TensorFlow is a very popular open-source library that is written in Python, C++ and CUDA. It’s uses span a range of tasks. Chief amongst them, is its use in machine learning applications for building neural networks. The TensorFlow library has seen many releases since 2015, and Google announced the latest update a couple of days back – TensorFlow 1.5. According to the team, they were monitoring “feedback about the programming style of TensorFlow, and how developers really wanted an imperative, define-by-run programming style”. CloudQuant Thoughts: TensorFlow is a very popular tool that many data scientists use in their work.